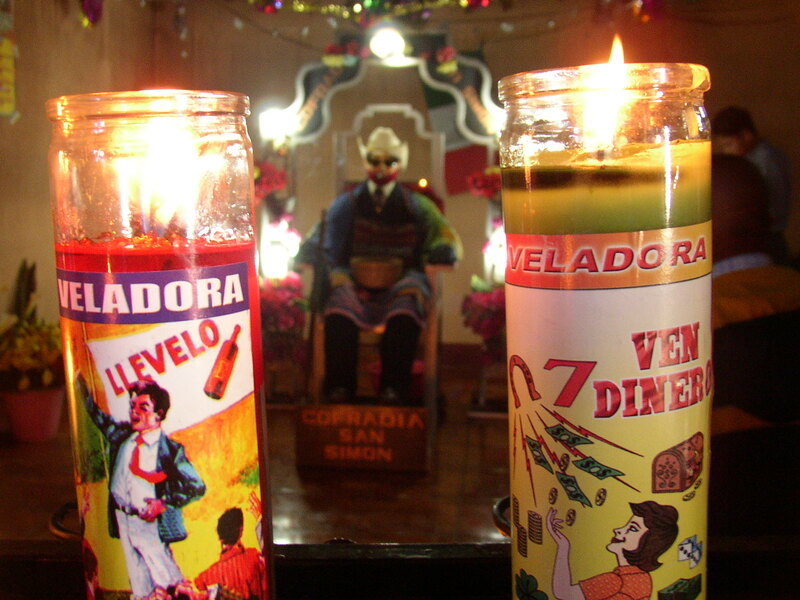 It is hard to imagine anything more unapologetically artificial than San Simón, the odd hybrid of Mayan god and heretic saint who wanders from house to house in Guatemala, generating temporary shrines around himself wherever he comes to rest. His anatomy includes plastic masks and mannequin parts; silk ties, cowboy hats, and sunglasses; christmas lights. His retinue is casually mercenary; they lounge in the corners of the shrine accepting without reaction the expected fee for visiting Him (extra for photographs). And if you’ve forgotten to bring an offering, there is always someone nearby to sell you anything you might need. Everything about San Simón seems calculated to dispel any sense of solemnity, let alone divinity. And yet, far from repelling this solemnity, he exudes it. The air in his shrines is thick with the sort of hush that one associates with cathedrals or caves, and the colored prayer candles that burn before him seem to sit within the gaze of something living and watchful, each candle representing a crisis whose resolution lies at the mercy not of blind chance but of a roguish fate who can indeed be bribed. How can this be? What is the source of San Simón’s paradoxical gravitas? Can it be his confidence, the fact that he doesn’t feel the need to affect sublimity? Perhaps it is his enigmatic approach to representation. San Simón is by no means separate from the many statues that circulate across the Guatemalan countriside, and in this sense there are many San Simónes; they are each San Simón and they are all San Simón. The individual statues are clearly intended to be more than mere depictions. They are given rum to “drink,” cigarettes to “smoke,” and in many cases women from the community take turns sleeping with them. Every effort is made to build around them the mystique of a living (and somewhat lecherous) person, an effort that is seemingly at odds with the kitschy artificiality of the figure. And perhaps this is the source of his power, the fact that he must be and cannot be what he claims. He is representational art pushed to a bizarre extreme, a process of portrayal bent on simultaneous self-transcendence and and self-sabotage. And of course, he grants wishes.